For the most hearty of the Frozen Few, this was the DAY ! Steady strong southerlies, gusting to 20kts, sent skippers repeatedly planing down to the distant leeward mark. Vigorous clean starts, no dunkings, made this a fitting finalé to the historic 2010-2011 Frostbite season. 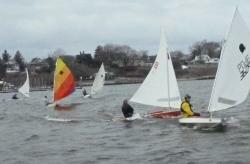 Thank you many friends from around New England - who loaned sails, spars and foils. 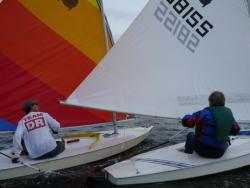 Thank you Laser Performance and Intensity Sails - who helped us to re-rig. Thank you Port Edgewood - who loaned us a winter chase boat. Thank you Edgewood Yacht Club. With 8-10kts N-NE, a gray mist, some sleet, but little chop, the Frozen Few sailed 5 starboard-rounding races in the next-to-last day of the Spring Series. At the end of the day, Ray left the parking lot with still half a box of Dunkin Donuts treats. Meanwhile the starts (short line, long course) were made-to-order - all of the half-dozen boats crossing the line within 10 seconds of the gun, including the occasional round-turn for the boat that failed his attempt to bluff onto the pin end. Thanks to Jonathan and Bill S, for sitting in as Race Committee. 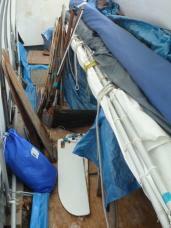 That's the conclusion we reached as we stood in a pile of borrowed Sunfish sails, lines and daggerboards. Edgewood's winter sailors, the "Frozen Few" needed to keep racing their Sunfish - not so easy, when the sails, the boards, the rudders and all the lines got burned up. So when the call from Frozen Skippers went out, the reply was quick and generous: our folks have collected a dozen borrowed rigs (sails, masts, booms, and sheets) 20 daggerboards, a dozen rudders, loan of a chase boat for running the races, invitation to change clothes and store gear inside from Port Edgewood, absolutely startling support on re-building from Laser Performance Rhode Island (in Bristol), great help from Intensity Sails (in Cranston), tolerance for the Frozen Folk bumping through the carpentry and re-shuffling that the EYC Steward and crews are up to, and -- and this is to be emphasized -- good wishes and "what can I do for the Club?" from the many folks who know, and who are affectionate toward, Edgewood Yacht Club. Check the website for a list of friends and a summary of what's arrived. Wind couldn't quite make up its mind for direction, but seven FrozenSkippers were on the water for the 1100 start. Kyle, in spite of losing the entire mainsheet Harken block, bested Fauss by one point to get the top score for the day, in a mixed chop and moderate temperature. This leaves season front-runners Fauss and DavidW scoring only two points difference for the 2010-2011 champonship, with Fauss and Kyle eleven points apart on the Spring Series. With two more days left to settle the Spring Series and the Season scores, racing continues Sunday Feb20.